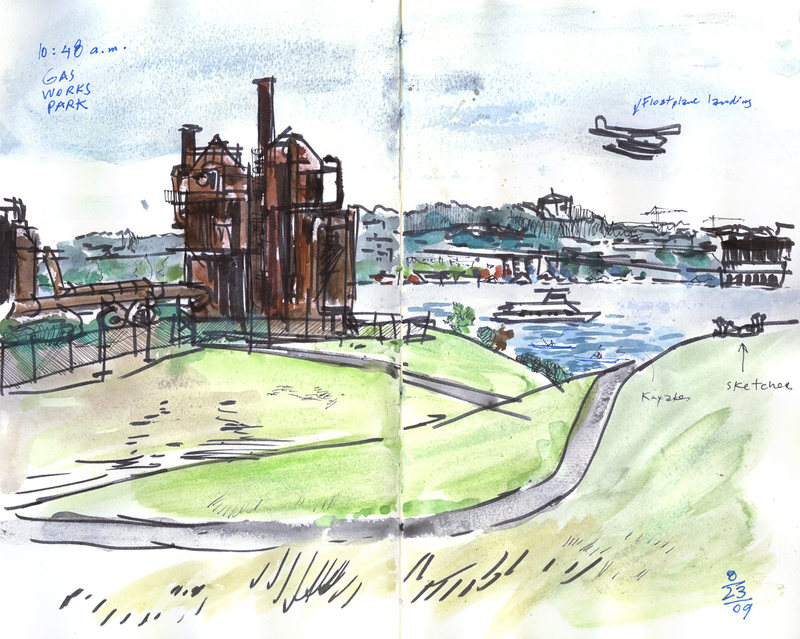 My senses were overwhelmed this morning from the minute I arrived at Gas Works Park. Wow. I had never been here before. What an impressive location. You have the intricate machinery of the former coal plant, the lake, the skyline, boats, floatplanes, you name it. How am I going to draw all this? After meeting everyone, I wander around for a bit before settling on a spot for my first drawing, which you can see above. Then I went to the hill where people go to fly their kites. That's where Thomas Thorspecken had chosen to sketch. 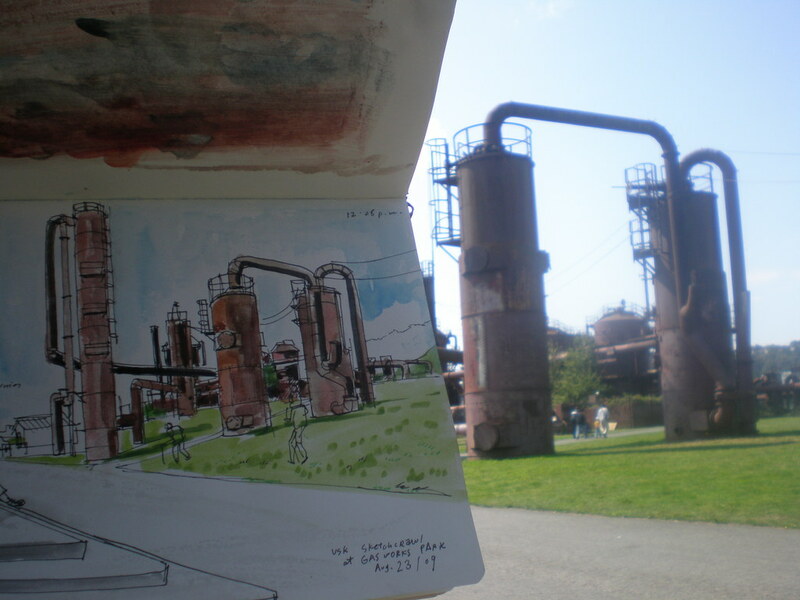 Tom is vacationing in the Pacific Northwest and stopped by for the sketchcrawl. 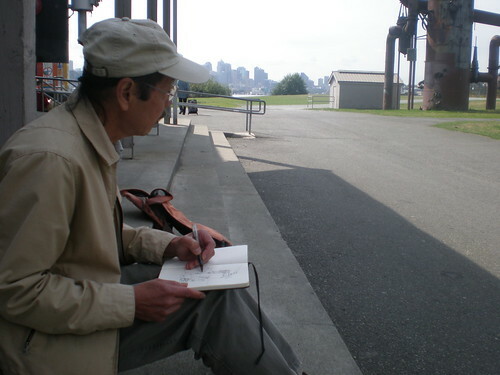 It was a treat to meet him and flip through his sketchbooks: page after page of flawless scenes and captivating characters. When I got up there where he was drawing I tried to distract him hoping he would mess up the sketch a little bit. But nothing. Not a move. That's how the pros do it. 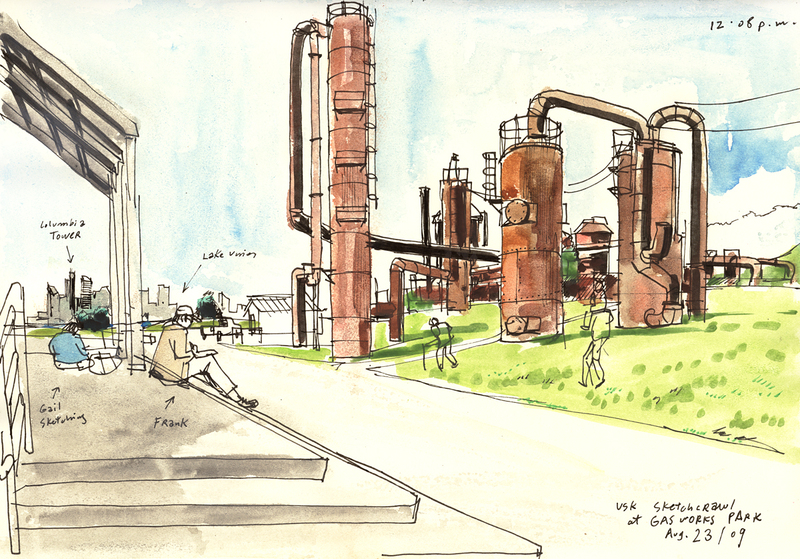 For my last sketch I joined Gail and Frank near the rusty machinery. 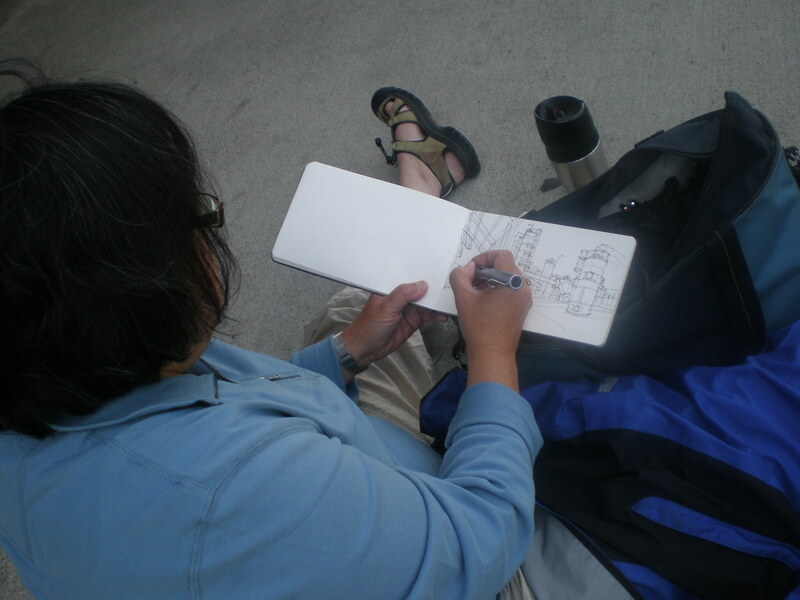 They were all laughing and joking but when they saw me they decided to get some work done, and in no time some beautiful drawings appeared on their sketchbooks. Amazing. That's it from me folks. Can't wait till the next one! 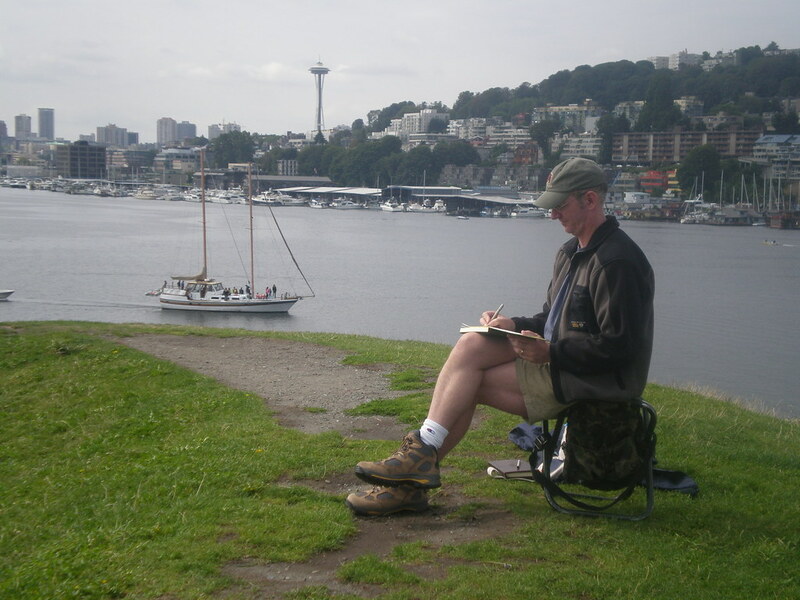 Remember to mark your calendars for Sept. 19 at the Ballard Locks, coinciding with the 24th World Wide SketchCrawl. More photos from today on this flickr set. wonderful images. Especially like the sketch at the top of the entry. 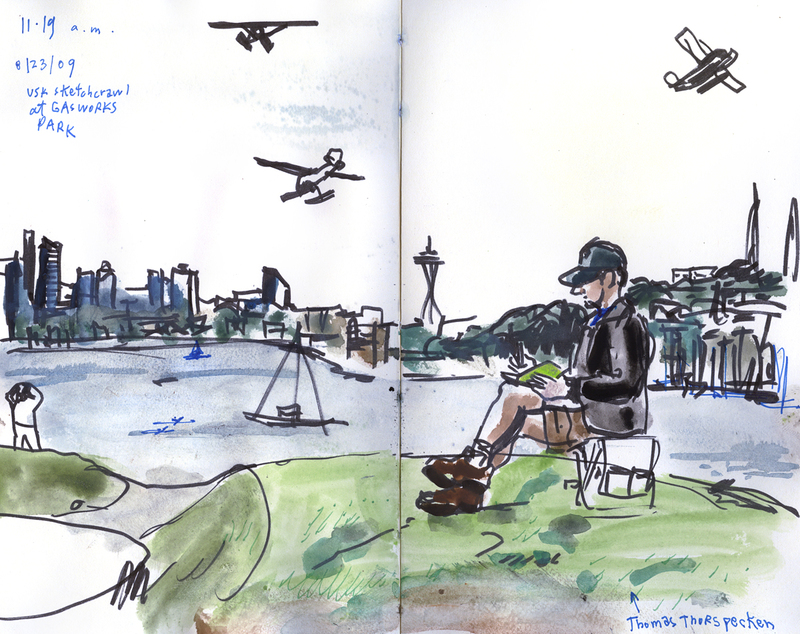 Watching a flock of seaplanes take off early in the day, I thought, Gabi will be sure to capture one of these! And you did!